In the West, Sakyong Mipham Rinpoche serves as temporal and spiritual director of Shambhala, a global network of meditation and retreat centers. The Sakyong—literally “earth-protector”—is a “dharma king” and lineage holder of Shambhala, a tradition that emphasizes confidence in the enlightened nature of all beings, and teaches a courageous life, based on wisdom and compassion. He also holds the Kagyü and Nyingma lineages of Tibetan Buddhism. 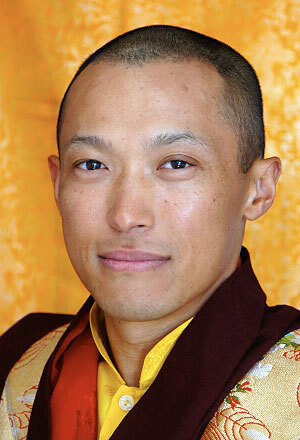 Sakyong Mipham Rinpoche was born in 1962 in Bodhagaya, India, to Lady Könchok Palden. He received an initial Buddhist education in India, later joining Chögyam Trungpa Rinpoche in England and North America. As a young man, the Sakyong studied with great masters His Holiness Dilgo Khyentse Rinpoche and with HH Penor Rinpoche. He is married to Khandro Tseyang Palmo, daughter of His Eminence Namkha Drimed Rabjam Rinpoche, head of the Ripa lineage. Sakyong Mipham Rinpoche has written a number of books, including the national bestseller, Turning the Mind into an Ally, Ruling Your World, Running with the Mind of Meditation, and The Shambhala Principle. He is also an avid poet, artist and athlete. Through the Sakyong Foundation, he engages in supporting organizations and projects whose activities exemplify the vision of Shambhala. He travels extensively, teaching throughout the world.